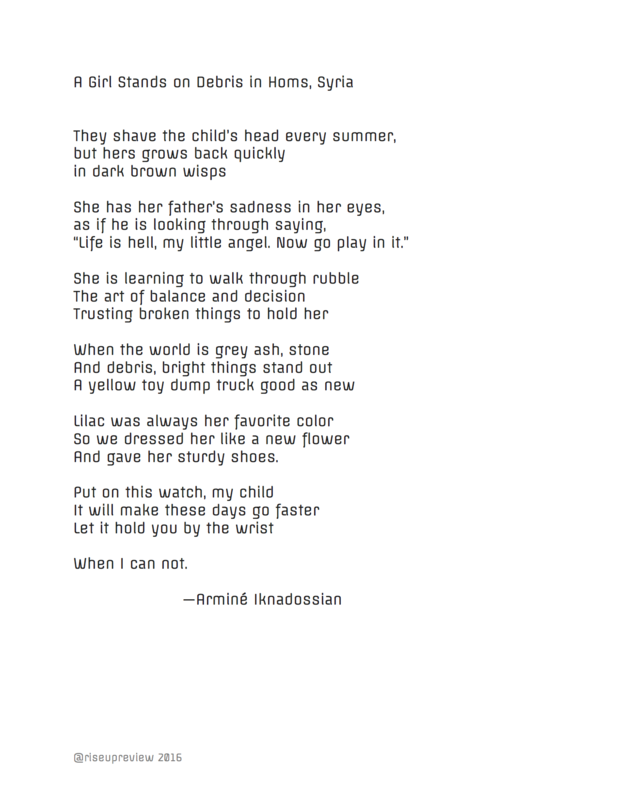 Armine Iknadossian fled Beirut, Lebanon for Pasadena, California with her family in 1978 to escape the civil war. She spent her childhood avoiding indoctrination from evangelical Christians and watching after her twin sisters, which is also the primary reason she has chosen to remain childless. After earning her BA from UCLA, she worked as assistant editor to syndicated columnists Arianna Huffington, Robert Scheer and Moly Ivins. Armine’s teaching career took over for the next 20 years, during which time she served as a recitation coach for Poetry Out Loud’s National Recitation Contest. She later earned her MFA in Poetry from Antioch University, Los Angeles during which time her mentor Richard Garcia nominated Armine for a writing fellowship at Summer Poetry in Idyllwild. The Los Angeles Writing Project at Cal State LA also awarded her writing fellowships where she serves as a writing consultant. In 2015, Armine retired from teaching in order to support the literary arts and focus on her two manuscripts god(l)ess: The L Is Silent and Resident Alien. She is currently one of the bookstore managers at Beyond Baroque Bookstore aka The Scott Wannberg Poetry Lounge where you can purchase her newly released chapbook United States of Love & Other Poems. She looks forward to serving as a Writer in the Schools (WITS) for Red Hen Press this fall.